Nutritionist, researchers and scientist believe the flax seed is the most important health-promoting supplement which is in K-flax. Nearly every system in the body can benefit from the flax seed oil’s natural properties including the cardiovascular system, immune system, circulatory system, reproductive system, nervous system as well as joints. The protein in flax seeds is easily digested and contains all the amino acids needed for building a strong body.They also contain a special fiber called mucilage, this fiber in flax acts as broom sweeping the colon of toxic material, metabolic waste and dried mucus. Mucilage helps stabilize blood sugar levels, and is a natural laxative. Flax fiber is an excellent food for friendly bacteria in the intestine, which keeps disease-causing organism in check. Flax seed contains lignans the have anti viral, anti bacterial, antifungal properties. Flax seed have the riches source, wheat bran. Lignans have anti-oxidant properties. 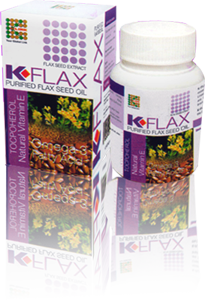 K-flax seed oil, purified and standardized and stabilized to 75% Alpha Linolenic Acid (Omega 3). It also contain approximately 10% of LA (Linoleic Acid – Omega 6) and the third claimed ingredients is Natural Source Vitamin E. Vitamin E is a very potent natural fat soluble antioxidant, which will maintain the stability of the active ingredients, which also protect the cells from oxidative damage. Body cannot manufacture these fatty acids and these need to be obtained from diet supplements. Many people do not obtain adequate amount of essential fatty acid Alpha Linolenic Acid. The products are manufactured by an ISO 9001:2000 GMP Company. Flax seed oil in K-Flax is also a powerful detoxifying agent. What are the Benefits of Supplementing with Flax Seed Oil? Flax Seed Oil increases the Body’s production of energy and also increases stamina. Flax Seed Oil strengthens finger and toe nails. It can improve eyesight and perception of colours. It may improve the function of the liver. It may be helpful in the treatment of Dandruff and also dull hair. Flax Seed Oil may help in the healing of sprains. It can relieve some cases of Premenstrual Syndrome (PMS) in ladies. Flax Seed Oil takes a bit of time to be absorbed into the body before the full beneficial effects begin, it may range anywhere between a few days to as many as six weeks, depending on your overall well- being. If pregnant, nursing or under medication, consult your physician before using this product. K-FLAX is not a drug and not intended to diagnose or treat or cure any disease.